"Janet Yellen will tell you we're never going to have a bear market again because she's smarter than we are, she's smarter than the markets, and the central bank has things under control now. She publicly stated this. Do not worry. We will not have financial calamities again. 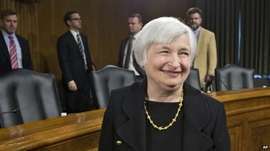 Head of the central bank in America has said that out loud officially, Mrs. Yellen-- yeah, Mrs. Yellen. I happen to have a different view. Now if you believe the American central bank, you shouldn't be talking to me at all. But we've had, we used to have bear markets every several years. We always, always since the beginning of the republic. In my view we will have them again. And the next one is going to be horrendous, the worst-- you came in the business in '86. It will be the worst in your lifetime, in your financial experience. And the reason, in 2008 we had a bear market because of too much debt, staggering amounts of debt.... since 2008 the debt has gone through the roof. Every country in the world talks about austerity. Nobody has reduced their debt in the last few years. Everybody has increased their debt in the last few years. And so the next time we have a bear market, it's going to be horrendous because of this. Even China-- in 2008, the Chinese had a lot of money saved for a rainy day. It started raining in Singapore. They had a lot of money saved for a rainy day. It started raining. They started spending and helped save the world. But even China has a lot of debt now."